dbForge Fusion for Oracle is a useful Visual Studio plugin for easy and efficient database development and management. The tool also provides an easy way to manage SQL Server connections. dbForge Fusion for Oracle is a useful Visual Studio plugin designed to enhance productivity of Oracle database development and simplify data management. The tool provides an easy way to manage Oracle connections. 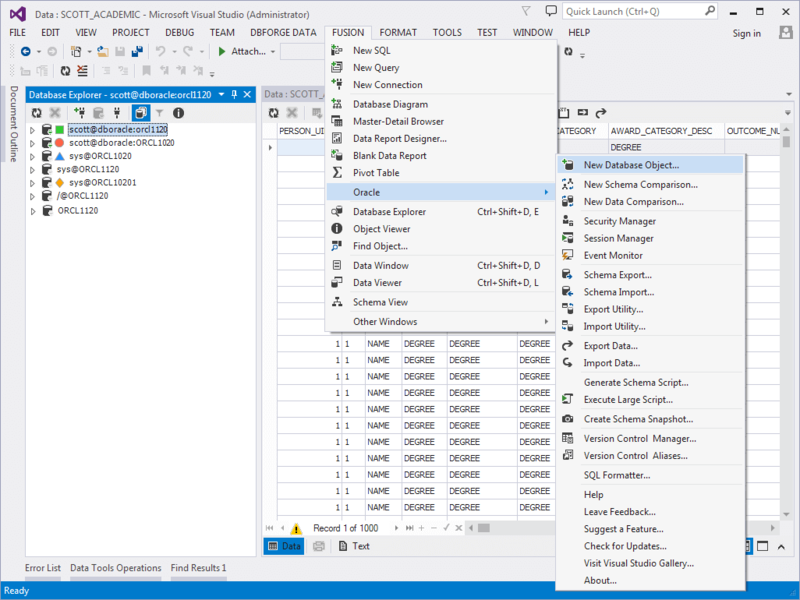 Full integration of dbForge Fusion for Oracle with Microsoft Visual Studio allows developers to explore existing databases and design complex SQL queries. Navicat - PostgreSQL Client - a GUI Tool for PostgreSQL admin and Access to PostgreSQL, Excel to PostgreSQL conversion. Navicat is a set of graphical database management, reporting and monitoring tools for PostgreSQL database systems. Restores Microsoft SQL Server databases, fixes the structure of corresponding documents and permits repairing the latest changes in database files, absent in older backups. Guarantees the safety and privacy of database restoration in all sessions.